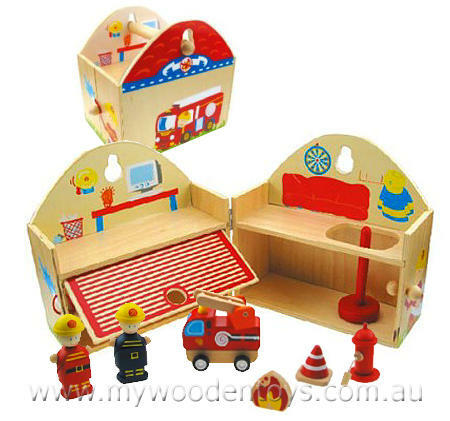 Wooden Fire Station Playset is a beautiful set of toys all contained in a carry box which is an opening hinged fire station. This fire house opens up to reveal an office, a pull up garage door and a red slide down fire pole. Included in the set are a fire engine, two fire fighters, a fire hydrant, a small fire (don't worry it is under control) and a warning cone. This is a brilliant set. All it needs now is a chief to oversee operations. We like this because: "Great that it all packs away into itself."